As Mann wrote, “every tune in this album has some relationship to the story of the gradual blending of Afro-Cuban music and American jazz.” The musicians include Mann, Jimmy Heath on tenor sax, Carmel Jones on trumpet, Chick Corea on piano, Dave Pike on the vibes, other talents too numerous to mention. Thematically Latin, the tunes include Senor Blues, Watermelon Man, The Jive Samba, … all arranged by Oliver Nelson a modern master. 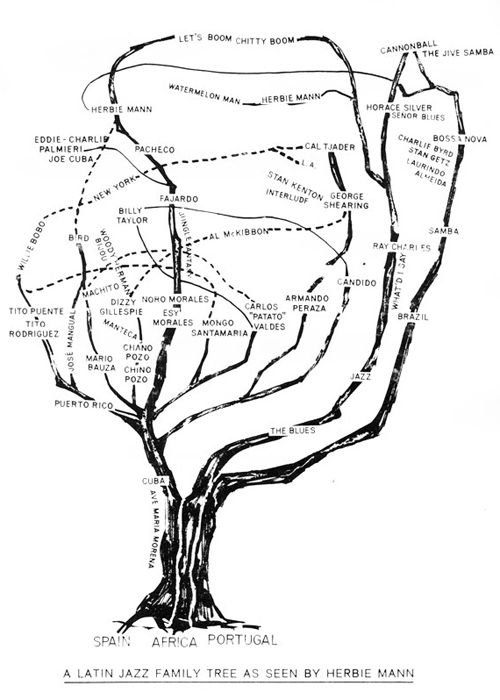 And check out the “family” tree as depicted by Herbie Mann; dig it!